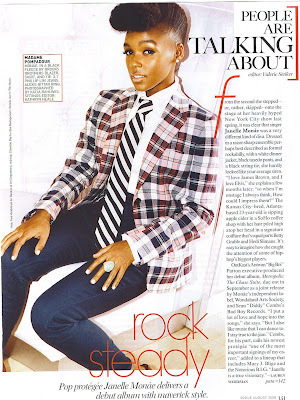 Janelle Monae is a new breed of artist that is makin waves where ever she treads. She has emmaculate taste in clothing and music. Janelle IS A FORCE TO BE RECKONED WITH. How many people make the Vogue magazine before their debut album has dropped? How many artists, make the Vogue Magazine, at all. CONGRATULATIONS, Janelle, the Vogue Mag score is MAJOR. See videos below of Janelle's raw exemplary talent.